Millennium 7 Publishing Co.: YOUR Artificial Intelligence Social Media Marketing? 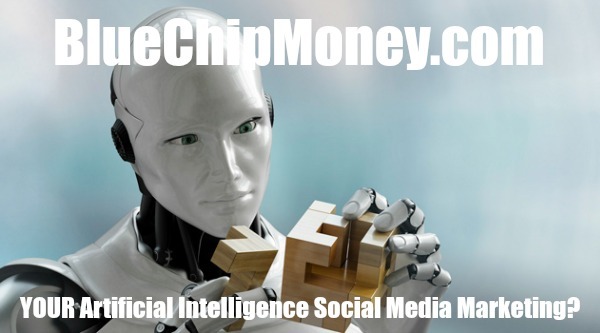 YOUR Artificial Intelligence Social Media Marketing? Artificial Intelligence and Social Media: Will AI Transform Social Media Marketing? If you’re involved in marketing, you must be somewhat familiar with both artificial intelligence and social media. Both technologies are significantly impacting the world of marketing. Gone are the days when businesses only focused on pamphlets, TV ads, newspaper ads, and other forms of traditional advertising methods. How are Artificial Intelligence and Social Media Changing Marketing? Marketing is one of the fields that is highly impacted by technology and changes in the world. A marketer needs to be updated with the latest trends and technologies to keep on performing. With recent statistics showing more than 2.4 billion active social media users, businesses will bear a huge loss if they are not getting involved in social media marketing. On the other hand, AI is impacting both personal and professional aspects of a person’s life. A study shows that the growth in external AI investments is 3X, and the AI technology is rapidly improving. The businesses that leave AI behind can also be missing out on the enormous benefits of AI. AI is one of the most influential technologies that has ever been developed in human history. It’s now impacting social media marketing in many different ways. Here are some of the ways that AI is transforming social media marketing. The use of slack bots has helped social media marketers in many different ways. All the guesswork that social media marketers used to do in the past is not needed now, thanks to slack bots. Modern social media marketers can develop effective posts to promote their products and services, and now they do not have to make guesses to create content that works. These slack bots are equally important in content marketing as well. The slack bots help with the in-depth analysis of all the posts that are promoted on social media platforms that are related to your niche. The slack bots also help in predicting the chance of success of various posts on different social media platforms, by comparing the posts with other similar posts that are promoted across these platforms. Avoid the headaches of guesswork with the use of slack bots, and enhance your chance of creating an effective social media marketing campaign. The customer service of a company is highly impacted by the introduction of AI. According to this study, around 42% of customers who complain in social media platforms expect an answer from brands within 60 minutes. It’s practically impossible for human beings to provide 24/7 customer service to their customers. This is where AI is playing a crucial role for brands in enhancing their customer support. The AI is still in its early phase, and is not yet ready to solve every problem of customers on its own, but it is enhancing the quality of customer service. Another survey shows that a large number of customers want to send a text message to the brand instead of calling the customer support team for their problems! Some brands are already using AI to detect what customer problems should be prioritized. The use of chatbots can help in filtering spam posts and fake social media accounts, which saves the customer support team a lot of time. The use of AI for customer support can help you generate leads and boost conversion rates via social media marketing. Text mining and marketing automation is now a reality in the 21st century, and it’s happening due to machine learning and AI. Text mining means the analysis of both structured and unstructured data across various social media platforms to discover buyer tastes and preferences – which helps in predicting customer behavior. All the vital information that can be extracted from text mining can be used in developing a personalized marketing strategy. The targeted marketing automation is possible with the information that can be extracted from text mining, and it can be utilized to help get the maximum out of your marketing campaigns. Plus, you can do a lot more with marketing automation combined with AI and machine learning. There is no need for you to think long and hard about your audience. The AI technology can predict the optimal timing for social media posts, which can help you reach larger and diverse audiences to maximize the impact of your social media marketing campaigns. Facebook is just one of the technology giants that are massively investing in artificial intelligence. Because Facebook is emphasizing AI so much, it has made the tagging function easier (with the help of AI). Facebook Facial Recognition saves a lot of time for users who want to tag the people on an image, as Facebook automatically recognizes the person on the image with the help of its facial recognition technology, powered by AI. In the future, Facebook may even utilize the history and preference of users to recommend right offers, shopping places, and products. Pinterest is certainly not lagging behind regarding the use of AI. Kosei (a data software company) was acquired by Pinterest and is now working to allow Pinterest the ability to provide the personalized recommendation feature. So now, Pinterest can provide recommendations based on user-specific searches and interests. LinkedIn and Bright have also worked together to improve the features of LinkedIn. Bright is a job search company acquired by LinkedIn that makes use of AI and machine learning to provide right recommendations to both job seekers and companies. LinkedIn analyzes hiring patterns, job description, job location, account info, and other important information to make accurate suggestions and recommendations for recruiters and job seekers to find their match. Many people are going to lose their jobs due to the revolution of AI. This is not my prediction; this is what the results of this study indicate. It predicts that around 38% of American jobs may be lost due to AI, and many have already lost their jobs due to AI. Why? It’s because the nature of jobs will be completely transformed by AI. Businesses may have to think out of the box in the future about how to use AI technology to have a competitive advantage in their industry. Guest Authored By Stevan Mcgrath. Stevan is a marketing professional and a freelance writer. His specialties include digital marketing, SEO, and social media. Need a specialist writer to write on these? You just found the right person. Follow Stevan on Twitter. “If you want to be in business, it’s better that you start implementing AI technologies now because soon, AI could be a basic necessity for a business to stay in the competition.